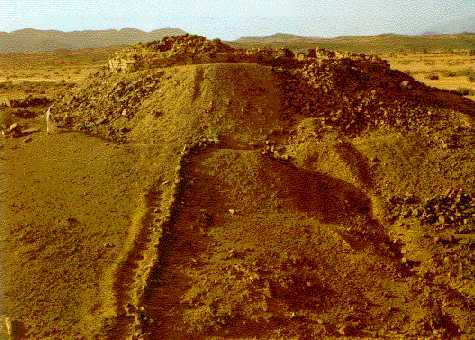 In Abalessa, the ancient capital of the Hoggar region, there is the tomb of the famous Tuareg queen Tin Hinan. About this famous ancestress of the Tuaregs following story is told: Tin Hinan came in the company of her maid-servant Takamat from Tafilalet in South Morocco to the Hoggar. There she became the first Tamenokalt (= Queen) of the Tuaregs and her fame was so great, that even today the Tuaregs call her »Mother of Us All«. Her sepulchre was also a place of pilgrimage and worship, so there were found hints that inside this tomb healing sleep was practised. 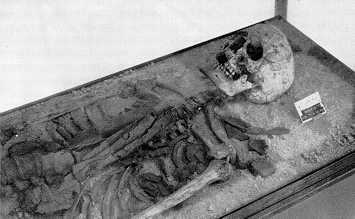 The corpse of the famous Tin Hinan was found when the grave was excavated by archaeologists. She was lying on a finely carved wooden bed and was covered all over by jewels. So she had seven silver bracelets on her right forearm and on her left forearm seven gold bracelets. It is impressive that the tomb of Tin Hinan was never plundered, it shows how enormously this African Amazon queen was adored by the natives!